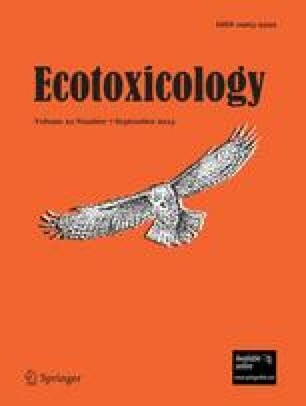 Samples of bat guano, primarily from Mexican free-tailed bats (Tadarida brasiliensis), were collected at nine bat roosts in caves in northern and eastern Mexico and analysed for organochlorine residues. DDE, the most abundant residue found in each cave, was highest (0.99 p.p.m. dry weight) at Ojuela Cave, Durango. Other studies of DDE in bat guano indicate that this concentration is too low to reflect harmful concentrations in the bats themselves. The DDE at Ojuela may represent either lingering residues from use of DDT years ago in the Ojuela area of perhaps depuration loss from migrant bats with summer maternity roost(s) in a DDE-contaminated area such as Carlsbad Cavern, New Mexico. Presence of o,p′-DDT at Tio Bartolo Cave, Nuevo Leon, indicates recent use of DDT, but the concentration of this contaminant was low. Possible impacts on bat colonies of the organophosphorus and carbamate insecticides now in extensive use are unknown.